When something is crisp, it means that it is hard but brittle or firm and fresh. Crisp also means ‘precise and clear,’ ‘neat‘ or well groomed,’ and ‘lively.’ When we’re talking about weather, crisp means ‘cold but invigorating’ and when we’re talking about people or someone’s attitude, it means ‘unfriendly’. In the US, a crisp is a dessert made with apples or other fruit and baked with a crunchy topping, similar to the UK dessert called a crumble. In UK English, a crisp is a very thin slice of potato deep-fried in oil, called a potato chip or chip in US English. Ben bit into the crisp apple. Even though Davina was thousands of miles away, her voice was perfectly crisp and clear. George's crisp appearance impressed the interview panel. The song had a crisp tempo. It was a beautiful, crisp winter's day. From Linda's crisp reply, I guessed my question had annoyed her. We're having apple crisp for dessert. I like to snack on crisps if I'm watching a film. You may have seen a few recent news stories about something called CRISPR (pronounced crisper). it is actually an acronym that stands for Clustered Regularly Interspaced Short Palindromic Repeats. They are, in simple terms, short DNA sequences that are repeated, with different sequences between them. They are found in many types of bacteria and function as a defense mechanism against viruses. Scientists have recently found ways to use CRISPR sequences to easily and efficiently edit the genome, which has led to experiments in medicine, to cure genetic diseases. While all the experiments are still in initial phases, and we won’t see any medical application of the technique for quite some time, many scientists are hopeful of the possibilities of CRISPR. Crisp dates back to before the year 900. The Old English adjective crisp (which has remained unchanged) originally meant ‘curly,’ and came from the Latin adjective crispus (curled, wrinkled, or having curly hair). It can be traced back to the Proto-Indo-European root (s)ker- (to turn or to bend). The meaning ‘brittle’ first appeared in the early 16th century, probably because of how some flat foods curl when cooked to this point. The figurative meaning (neat or brisk) was first used in the early 19th century. The verb comes from the adjective, and appeared in the late 14th century, originally meaning ‘to curl.’ It took on the meanings ‘to become brittle’ and ‘to make brittle’ in the early 19th century. 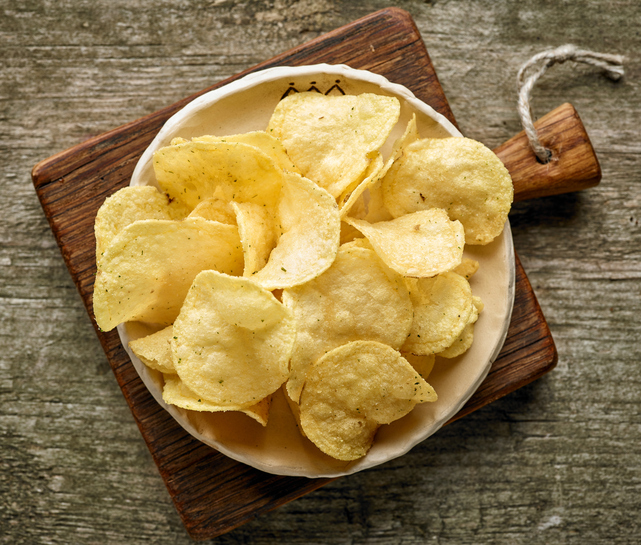 While crisp has been used as a noun since the 14th century, the noun meaning we know today (potato chips in the UK) dates back to 1929.